Rub taco seasoning over pork. Place pork in 5-quart slow cooker; add salsa and beans. Sprinkle with bouillon. Pour beer over pork. Remove pork from cooker; place on cutting board. Cool pork slightly. With 2 forks, shred pork, place is medium serving bowl. Into a 4-cup glass measuring cup, strain sauce through strainer to remove beans. Stir 2 cups sauce and black beans into shredded pork. 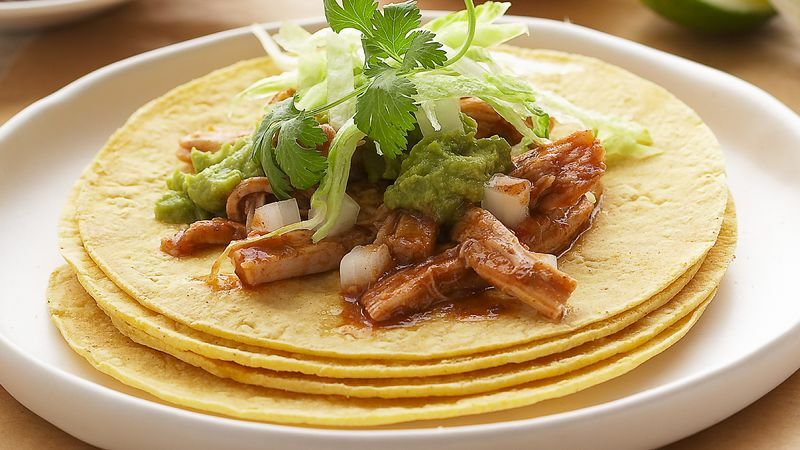 Serve pork and beans with platters or bowls of warmed tortillas, shredded cheese, chopped onion, lime pieces, shredded lettuce, and cilantro sprigs.